I’ll be joining some friends and fellow makers at the craft fair at Elmslie House in Malvern on Sunday October 16th. The building itself is worth a look, and there are some amazing glass installations. If you are in the area drop in, it would be great to see you. I realise there is a bit of sea theme in a lot of the work I make. I like to work with a CD of coastal sounds in the background in my studio, and trying to catch the energy of waves in the glass in various ways is something I keep returning to. In addition to my single wave pieces I’ve also extended this sea theme with a series of works set in portholes. eBay has an astonishing variety of portholes on offer, and I now know a lot more about portholes than I did a month ago. Having been looking at cruises for my sisters Big Birthday gift means I thought a lot about what I’d like to see out of my window. I now have a giant porthole with an Antarctica scene, a smaller Caribbean scene, a tiny New York Statue of Liberty view and a test of my new bubble paint with copper fish for the least exciting porthole. The biggest porthole clearly came off a ship, and is so heavy I had to dismantle it before I could move it. They have a variety of glass holding mechanisms, two have screw fittings and could take very thick glass or even interchangeable glass images, whilst the one I like the least has a fitting that complains at even three mm of glass. This large porthole is sitting on my garden table. It is a fully functioning window and could be used as such, or would be great as a piece of garden art. I’ve been working on a birthday commission, for which I made a double thickness piece to give lots of variety and depth of colour. This was then free slumped to give a piece with lots of vigour. In between making these watery pieces I’ve started a series of Montpellier Cafe scenes ( the Montpellier in Cheltenham) as I made one as a raffle prize for the Montpellier writers Group who are celebrating an anniversary this month. There’s been a long pause in my posts to this page. Since the Open Studio last year I have moved house and built a new studio. I now have good light, a warm room and running water in the Studio. I am pleased to be able to say that I can now handle sheet glass safely again, and have begun working in a variety of ways rather than just with frit. Recent works include two commissioned triptychs, one an abstract piece in tawny and orange tones for a dining room in Cheltenham, and the other a rendering of a view in Cyprus for above a fireplace near Milton Keynes. This is photographed on acrylic stands before posting. Both of these allowed me to explore the commissioning process, new colours, and the excellent adjustabail hanging system which gives great ease of hanging for the customer. I’ve also been working on lower fired double sided pieces which have a rough powdery surface texture. 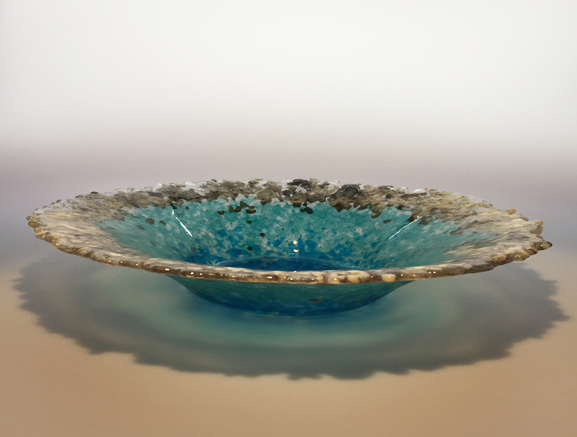 This piece is called Moongazer, and I am submitting it to the Bullseye Emerge competition. I’ll be open every day from tomorrow until Sunday 21st, 11-4. Also Friday evening 7-9. See more about the trail at the Cheltenhamopenstudios.org.uk website. I’m Venue 46. I’ve been busy getting ready for my exhibition at the Gardens Gallery in Cheltenham later this month. I’ve also just selected and printed labels for a small shared show at the Number 8 Community Art Centre in Pershore, where I have a few smaller items in a crafts case. I used some business card paper to make the labels, which was so much easier than any other technique I’ve ever tried, and which has produced neat consistent labels. 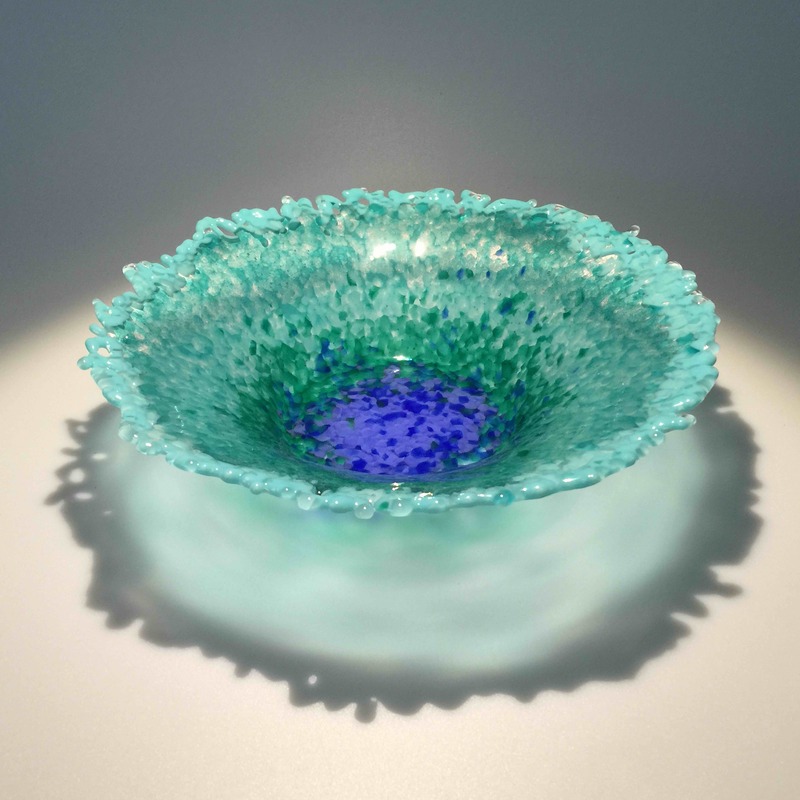 I also submitted six pieces to the Summer Show Focus on Glass in Cardiff, so the process of auditioning individual pieces and then considering how they work together has preoccupied me for some time. I’ve spent so much effort on this ‘auditioning’ process that I’ve actually had my previous City&Guilds tutor turn up in my dreams to discuss my work! Other than that, a few bowls, including some I really like, is all I have made over the last couple of months. More surgery on my wrist to remove a screw that had come loose from the previous surgery, followed by slipping in the shower while being super-cautious to protect my wound, left me with cracked ribs, which make breathing hard let alone frolicking with glass. I’m looking forward to a new programme of exploration and experimentation starting in May.